MUMBAI, INDIA--(Marketwire - March 8, 2011) - Most CEOs of leading companies seek a CFO who can help them manage the business, complement their skills and offer leadership; on top of their financial expertise. Their days as number-crunching senior accountants are long gone. Today's Chief Financial Officers are expected to be strategic thinkers who can deliver business results. While some may think that the role of CFO has shifted away from strategic advisor to more of a cost-cutter and controller, that's simply not true. The CFO role, in fact, has not become less of anything; it's just become more of several things. Read more to know about the leading CFOs in India, here. Business Review India is a leading digital media source of news and content for C-level executives focused on business and industry-specific news throughout India. 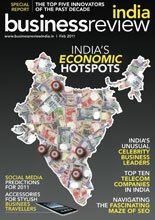 Business Review India is the territory-dedicated arm of the White Digital Media Group. Founded in 2007 by entrepreneur Glen White, White Digital Media retains a diversified portfolio of websites, magazines, daily news feeds and weekly e-newsletters that leverage technology to innovatively deliver high-quality content, analytical data, and industry news.